Magnesium is the vital nutrient most people neglect. An essential component of hundreds of enzymes the body makes, magnesium oil (or magnesium in another form) is often all the body needs to find its own way to normal functionality. And magnesium is very successfully, but not as commonly applied to the treatment of almost any kind of pain, when magnesium oil is applied directly to the skin. Magnesium oil also has benefits for skin. It can clean out pores, by eradicating tiny flakes of dead skin by removing the protein ‘glue’ on the surface. And regular use promotes the growth of healthy skin cells, wards off acne and will help with wrinkles. Magnesium is essential to life and fortunately it is found in common foods and is available in supplements that cost just pennies. If you already have a normal magnesium status, it is incredibly simple to keep your magnesium levels healthy. But if you don’t, it is very difficult to get the magnesium replenishment your body needs from any products you can take by mouth. Nutrition experts in the United States recommend about 400 mg of magnesium a day for men and 320 mg for women (a little for more teenaged males and for women during pregnancy). You could get that amount of the mineral if you ate 5 cups of brown rice every day. Or 8 ounces of nuts. Or 2-1/2 cups of cooked spinach or a dozen bananas. But since most of us don’t eat the foods we need for magnesium every day, getting supplemental magnesium from other sources is a good idea. The big problem with taking magnesium supplements by mouth is one that you probably will not find hard to understand. Magnesium compounds are laxative. After all, milk of magnesia, sometimes abbreviated M.O.M., is an old standby for relief of mild to moderate irregularity. When milk of magnesia hits the gut, it absorbs water, and the bowels move. But that is not a good way to get magnesium into your system. When magnesium-deficient patients have to go to the emergency room, it is usual practice in many places to put them on an intravenous drip of magnesium to bring their levels back up to normal. This is the standard operating procedure in treating most people who have heart attacks, transient ischemic attacks (TIAs), and eclampsia. Although the doctor will run a blood test to make sure the magnesium levels are low first. Magnesium IV’s are a sure way to get your bloodstream magnesium levels up to normal, and fast, but they aren’t exactly something you could or should do at home. And most women who have had the extremely high doses of IV magnesium to save their babies, up to 30 times what you would take on your own, have been excruciatingly unpleasant. But there’s nothing unpleasant about using magnesium oil. 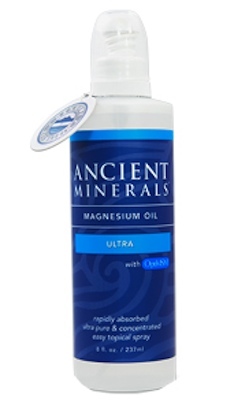 Absorbed directly through the skin, magnesium oil bypasses the digestive tract. There’s no need for urgent trips to the bathroom after you take it, and the oil starts working in your system right away. Just apply the oil to your skin, and let it flow naturally into your body, to help your body make the enzymes it needs to restore itself. Magnesium oil is something of a misnomer. It is not really an oil, but a liquid solution containing magnesium and other vital minerals, such as potassium, sodium, calcium, potassium, chloride and phosphorous, that has been largely evaporated to concentrate its healing contents. One of the best sources of magnesium oil is Dead Sea water, which, if you have ever taken a dip in the Dead Sea, feels oily even though there aren’t any actual oils in the water! When you apply magnesium oil to your skin, the minerals pass through your skin into your bloodstream. You can use it to soak your feet, add it to your bath or use it as a spray after you dry off from your shower (taking care to let it stay on your skin as you dry off in a warm, not too humid room). The use of magnesium oil and magnesium supplements is not either or – It is both. You can take supplements to make sure you get all the magnesium you need even on days you don’t make the best dietary choices, but you can use magnesium oil to correct deficiencies when your diet is especially bad, if you have diabetes, or if you have any of the many disease conditions that respond well to it. But Why Wouldn’t I Just Take More Pills? There is one simple reason it is never a good idea to take more than 300 mg of supplemental magnesium at one time, or more than 600 mg of supplemental magnesium orally per day, even if you are magnesium deficient, even though your body can use about 1,000 mg a day. Large amounts of magnesium supplements take by mouth are laxative. As little as 500 mg of magnesium taken orally per day, which is about the minimum amount that will do your body good, is laxative in about 45% of users. And taking 600 to 6,000 mg of magnesium per day, which is recommended for some disease conditions, is just not possible through the oral route. Almost everyone will wind up flushing away the needed nutrients, not just magnesium, but many more that would be expelled with it. Can I Make My Own Magnesium Oil? But making your own oily solution will not help you get the full benefits of magnesium. One of the ways the body uses it, is by regulating the flow of calcium out of the bloodstream and into the bones and muscles that need it, rather than into the cholesterol deposits where it can be harmful – even deadly. When you apply the solution, which also contains calcium compounds, to your skin, your bloodstream magnesium levels go up but your bloodstream calcium levels go down. The magnesium helps calcium go where it is needed and keeps it from going where it can cause damage. But why not send additional calcium where it is needed by using a product that already contains it? 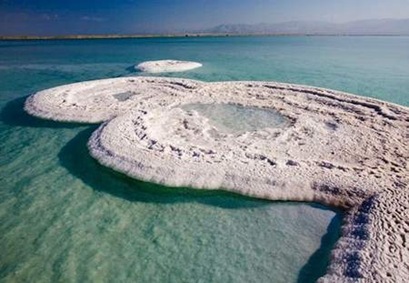 Of course, you could fly off to the Middle East, take a bus to the Dead Sea, and collect your own Dead Sea water (although you couldn’t put it in your carry on luggage, of course). So it really is a lot easier to use a standardized, sanitary product that is available and ready to use. An important fact you should be aware of is that although magnesium oil has no side effects, if you have low blood pressure, magnesium will lower it further.